Our maple syrup-cured, applewood-smoked pork belly. The raw pork belly, pre-cure. First, I apologize to my readers for not blogging more frequently. I’ve snapped the photos and written countless blog posts in my head that will be composed once this term ends. Somehow, amid this hiatus, more than three times as many readers clicked to my blog yesterday. Crazy how this little piece of Internet real estate works. My greatest cooking adventure of late has been to try my hand at curing pork belly, with the help of Chef Intaba. I know it’s almost cliched for a foodie to jump on the pork train these days, but it’s seems to be the most available local, sustainably-sourced meat these days. Plus, Intaba ordered half a pig she was willing to share (now I also have a rack of spare-ribs in the freezer, to be braised in some sweet Chinese style). 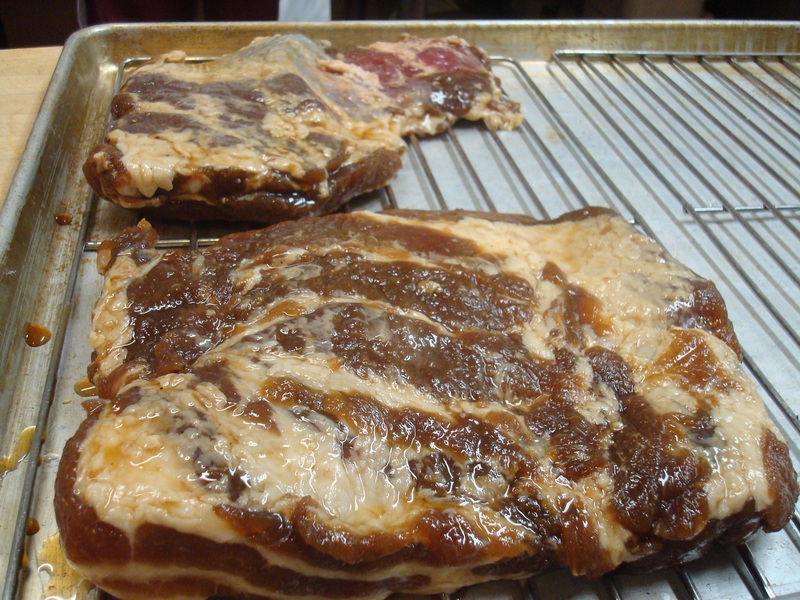 Curing the bacon, with a slather of maple syrup, kosher salt and curing salt, was uncomplicated. It’s ready to cook after a week curing in the fridge, but we finished it off first in Intaba’s smoker. We’ve enjoyed the salty-sweet, if not slightly tough flesh, with eggs and toast and in own Thanksgiving sauerkraut. Oh, and in some the jury’s-still-out chocolate chip-bacon-hazelnut cookies. I hope to finish it up in David Chang’s Fuji Apple Salad: Kimchi, Smoked Jowl & Maple Labne recipe. Let’s just say the pancetta didn’t go as well. 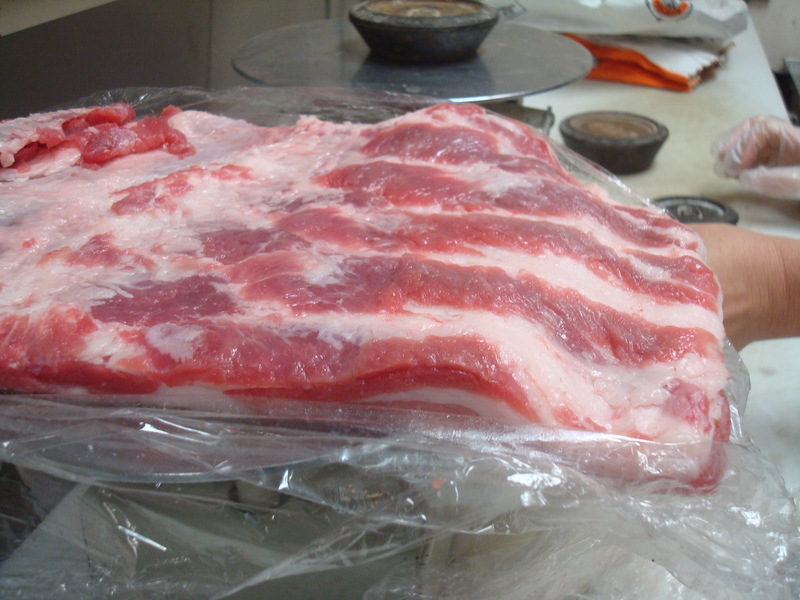 The week-long curing process, with its rosemary-black peppercorn-juniper rub, is the same as with bacon. 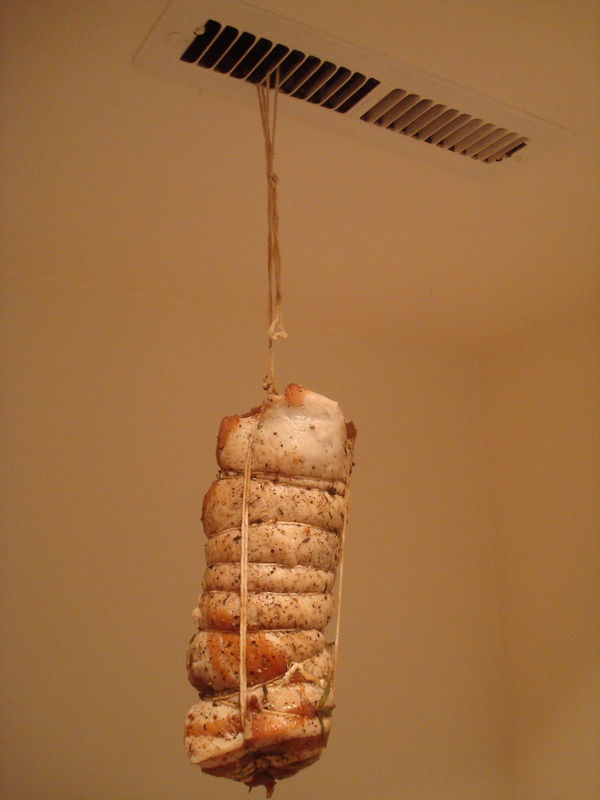 But while you don’t smoke pancetta, you do hang it to age for an additional two weeks. That’s where the complications come in. Perhaps our basement didn’t stay at the required 60 degrees (now I wish I had cured it in the garage, even if the colder temp meant it took longer). But the skin started to grow a white mold, so I cut it down a few days early. It didn’t smell rotten but something wasn’t quite right. Our too-thick pork belly wasn’t “completely firm but pliable like leather,” as the CHOW recipe recommends. We didn’t trim the fat evenly enough. So the exterior was hard as jerky but parts of the interior meat were still soft. I still cooked a bit up. Now Intaba is smoking the rest to remedy the situation. I’ll make bacon again, any day. 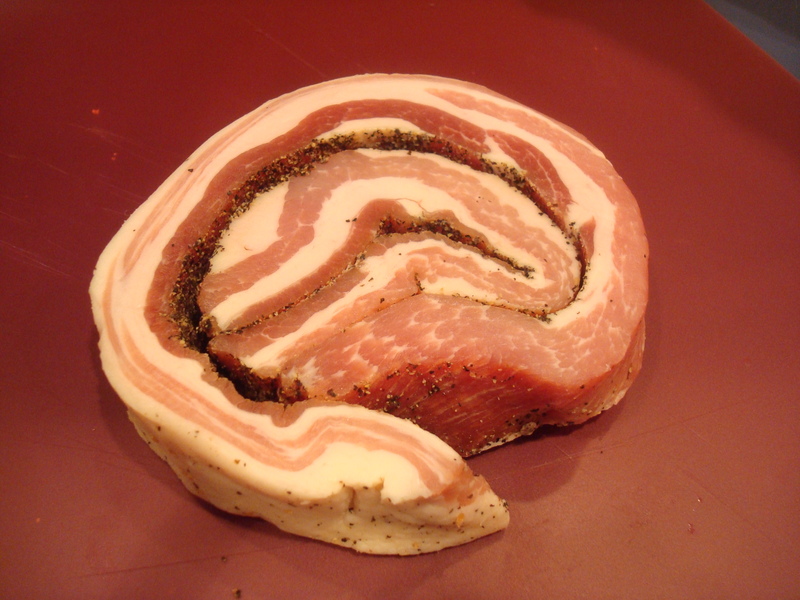 But when it comes to pancetta, for now I’ll stick to buying the imported stuff or at least professionally-made stuff. Or at least consult the charcuterie bible before my next attempt. Speaking of pork, I ordered some smoked ham slices and Italian sausage from red wattle heritage pigs through last week’s test run of Corvallis Local Foods. This brilliant new site is an online farmers market, where you can electronically order produce and meat from a dozen local vendors. Then you get your pre-paid order at a weekly pick-up at a local farm stand (the Brooklane/La Mancha Orchards of Anita Azarenko of OSU: they have the best organic Goldrush apples!). My friend George is heading it up. And busy Amy of Our Home Works markets and develops the software, which started with Eugene Local Foods and is rolling out to other locations, including Santa Cruz. Contact them to get such a local foods online marketplace in your community. And I promise we’ll back off the pork soon. I think the problem with your pancetta may have been that the environment was too dry. That’s why it was hard on the outside while soft inside. 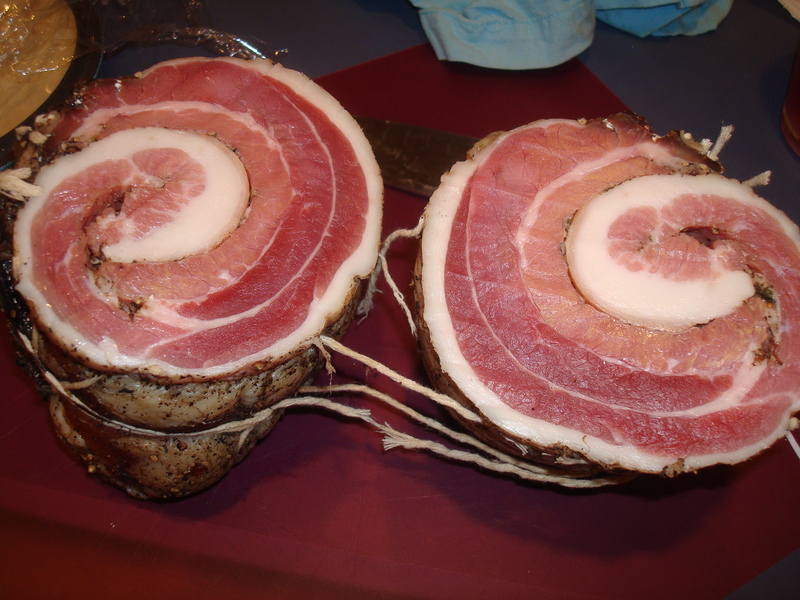 The usual recommendation for hanging pancetta is 2 weeks or more at 50-55 degs F and 65% humidity. The mould isn’t a big deal, so long as it’s white mould, like you get on the outside of salami. If you don’t like it, wipe it off with vinegar on a cloth or paper towel.